Keep your vitamin levels in check. 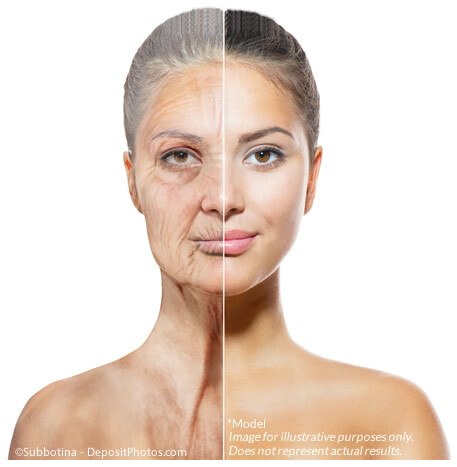 Having a vitamin deficiency can lead to feeling sluggish and "aged". Get your doctor to do a blood test to ensure that all your vitamin levels are normal. They may also recommend that you take a vitamin supplement if any are low. Reduce your calorie intake a bit. Scientific studies show that what and how much you eat may affect the years and quality of your life. Specifically, animal research indicates that restricting calories up to 40 percent fewer than normal have a beneficial effect on the markers of aging and disease. Of course, not every species has shown this improvement and studies on humans, and other primates are still ongoing. We recommend consulting with a doctor first before reducing your calorie intake. Eat more fiber. This is an important factor for aging well. Eating a diet low in animal fats and high in fiber can help keep your cholesterol level under control by increasing your HDL (good) cholesterol and reducing your LDL (bad) cholesterol which can help reduce your risk of stroke or heart attack. Fiber also has other benefits such as helping you feel full for longer so there will be less desire to snack throughout the day. Assuming you're getting your fiber from nice health fruits and vegetables you also gain the advantage of all the anti-oxidants that help slow the signs of aging. Oral health is essential to a long life and looking youthful. Many people associate having dentures as part of getting old so take care of your teeth for as long as you have them. When you have your teeth removed it can accelerate the appearing of aging in your face by causing your face around the mouth to have a sunken appearance. This can also lead to an acceleration of lines forming around the lips and mouth. Moisturize. Moisturize. Moisturize. The appearance of your skin is a key element to looking and feeling younger, so take care of your skin by using moisturizers. This will keep the skin hydrated and soft. Sometimes it will help to work with a professional dermatologist to determine the right type of lotion and moisturizer that is best for you. Exercise daily both with light cardio (walking) and weights. Again, we recommend consulting with your doctor before beginning any new exercise routine but if you are cleared, start to exercise with some weights. As you age, you start to lose your muscle density, so you have to make the most out of the muscle you have left. Get into a routine of weight-lifting a few times a week so that you can stay strong even as you go into your later years. This can also help tighten loose skin in areas that begin to sag over time. Don't overdo it with weight though - use the amount you feel comfortable with that gives you the feeling of a good workout after a few sets. Consider facial injections. Of course, you had to figure this would be on the list. Facial injections like Botox can help reduce the appearance of winkles and lines caused by aging. The results can have a big impact and can be seen very soon after the treatment. Check out the video on the right for some examples. To sum it all up, aging is an event that happens to everyone, regardless of age, gender, ethnicity, or religious affiliation. We are not defined by the effects of aging, rather we are defined by how we deal with it. If you read this article you should now be well prepared to age gracefully.